For the second consecutive year, I am pleased to announce that The Tin Fish has been selected for the 2012 Best of Minneapolis Award in the Seafood Restaurants category by the US Commerce Association (USCA). In recognition of your achievement, a special 2012 Best of Minneapolis Award has been designed for display at your place of business. 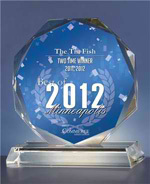 You may arrange to have your award sent directly to The Tin Fish by following the simple steps on the 2012 Best of Minneapolis Award order form.